The S7 is for the Progressive Swimmer. This type of swimmer needs extra buoyancy, so the S7 was designed to elevate the position of the triathlete in the water without compromising elasticity when it comes to swim strokes. The perfect tool to make sure swimming doesn't slow you down. An all-round sleeveless wetsuit that delivers many of the key technical benefits of the elite tier of the 2XU range. The inclusion of the rollbar, floating zip, SCS coating and 39 cell buoyancy paneling make the P:1 Propel Sleeveless a top-value wetsuit that will deliver the power needed to surpass the competition. The Openwater Squad kid’s wetsuit offers high visibility for open water safety with bright neon orange sleeves. There is no way your kid’s won’t stand out in the open water! The Zone3 Neoprene Warmth Vest is specially designed to fit under a wetsuit. This 2mm vest has a special titanium coating, to maximise thermal stability for the athlete in extreme conditions. If you're looking for a flexible wetsuit base layer that is going to give you added warmth while you're out in the water - whether on it's own or under a wetsuit. This highly anticipated suit brings together three years of race proven testing and technical refinements. Designed to give you the edge in and out of the water, the Alliance will help you produce better swim splits and faster runs in comfort. 2XU's P:1 Propel Wetsuit is a great all-round suit to enhance your swim performance. Technical features include a floating zip back panel which allows full flexibility whilst remaining exceptionally strong, and a rollbar for core buoyancy and an improved body position through the water. An SCS coating over the neoprene improves comfort, allows full freedom of movement and decreases fatigue. This coating also makes putting on and taking off the suit a simple task thanks to the reduced resistance, so you can speed up those all important transition times. The Adventure wetsuit is designed with a lot of the features used in the adult collection but with some slight changes to make them more specific for age range. Updated for 2017, the Reaction Sleeveless has been improved with more flexible upper body / shoulders and new, flexible lower leg panels for quicker transitions. Our main sleeveless suit, it has unmatched arm freedom and T1 speed. Blueseventy's entry level Sprint wetsuit has had a major redesign. Thinner neoprene and new strategically placed super-stretch panels greatly improve flexibility on the arms and legs. This is the best suit available in this price-range. 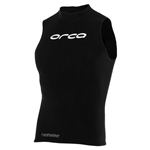 The Orca Swimrun Top has been designed specifically to perform in swimrun race conditions. Light weight AquaStretch fabric dries fast and provides supreme breathability - perfect for switching constantly between running and swimming. The latest generation Orca Heatseeker Vest is a thermal base layer designed to be worn under a wetsuit in cold water to increase your warmth in the water. It can provide an additional barrier against wind chill in any type of outdoor water sports. Made out of 2mm Super Stretch Neoprene, this suit is designed to keep kids warm and protect them from the sun while allowing them the freedom of movement they need to play, train, or learn to swim. The Aqua Lung Quantum Stretch Shorty Wetsuit offers a great affordable alternative to a full length triathlon wetsuit. May also be used for snorkeling. The ISHOF SaferSwimmer Float TPU is specifically designed to provide a safety aide for open water swimmers, serving three important functions without hindering performance or hindering your stroke. TPU is a high-performance polyester fabric that you see used to make products like flexible fuel tanks, inflatable boats and whitewater rafts. Quantity discount details below. The Torpedo has been tailored to 8 (Small), 10 (Medium) and 12 year olds (Large) to encourage water activity, with the benefits of warmth, buoyancy, safety and protection from the elements. Perfect for helping young athletes take the leap from the pool to the open water the Torpedo is a one of a kind wetsuit that is durable and comfortable.